includes a set of core strategic focus areas that align to our Mission and are integrated into our annual Program of Work operating plans. Goals are the core competencies of the Chamber that the leadership is committed to and will allocate resources.Strategies are continued and fresh approaches to advance the goals and will be pursued during the course of the plan. Providing members with opportunities and support thoughChamber programs, events and connections. A. Think Local – Improve visibility of business through “Buy Into Bay Area” identify and report on performance metrics and outcomes of the program. B. Events – Deliver signature events of value to members (i.e. golf, expo, bowling) and continuously evaluate effectiveness of activities as they relate to mission, relevance and return-on-investment. C. Connections and Engagement – Increase member and business understanding of Chamber programs and value; increase strategic touch points and use of technology platforms. D. Learning Opportunities – Implement world-class educational programs in varied formats throughout the year that meet members’ needs. E. Growth and Retention - Identify desired market share focusing on growth and retention goals set annually by the Chairman. Accomplish membership strategic outreach, focusing on quality over quantity. Promoting and facilitating relationships among business,academia and government. A. 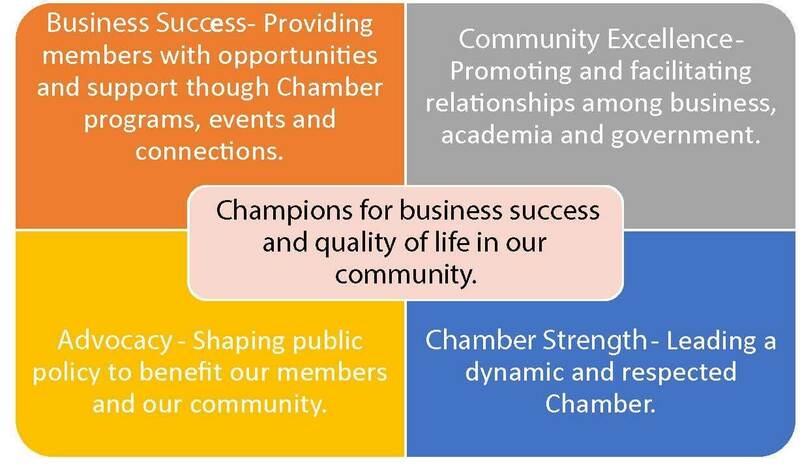 Awareness of the Chamber – Tell the Chamber story and its value to business, government, media, and the community through a wide variety of communication channels. B. Educational Excellence – Engage the business community to support educational initiatives and academia. C. Leadership Programs – Continue development of future leaders for the community and the Chamber through Leadership Clear Lake and Young Professionals; ongoing leadership training; and modeling of leadership. D. Quality Community Growth – Support economic and workforce development initiatives for a prosperous community and enhanced quality of life. E. Affiliate Forums and Relations – Rely on the affiliate business sectors to maintain community relations: Health Care, Aerospace, Marine, and Tourism. Shaping public policy to benefit our members and our community. A. Outreach and Visibility - Ensure that the Chamber is a recognized and respected influence in business and community issues. B. Coalitions – Lead or collaborate with organizations having mutual interests on issues of importance to the Chamber. C. Issue Identification and Analysis – Establish a process for identifying, reviewing and engaging on issues of concern to the Chamber and the community. D. Relationships – Build and maintain key relationships with local, state and national elected and regulatory officials. E. Awareness – Maintain a community position whereas the Chamber is a preeminent community public policy resource on positions and issues affecting business. Continue forums and luncheons to connect business with state and national delegations. Leading a dynamic and respected Chamber. A. Performance Excellence and Improvement – Continue the three-year cycle of evaluation and updating Chamber documents and processes. Study options for state or national recognition. B. Staffing and Professional Development – Provide for the professional development and quality workplace for employees to ensure that highly qualified staff can be hired and retained. C. Technology – Invest in the technology and platforms to support Chamber functions and customer relations management. D. Finances – Increase Chamber reserves to equal minimum of six months of the annual budget. E. Volunteer Leadership – Sustain development, orientation and performance of a highly effective board of directors. "Chamber 2020" provides the needed direction and clarity to ensure our collective success and prosperity. That success will be measured by growth of our membership, the health or our economy, the quality of our education system and community life, the reputation of our Chamber for leadership and integrity, and the effective implementation of our annual Program of Work consistent with our core focus areas. Th﻿e leadership of the Clear Lake Area Chamber of Commerce is confident and proud to be joining with every member of our great organization as we navigate the path ahead looking forward to the next three years and beyond.